Tomo's Japanese kitchen: Ikea localisation! Ikea always has those sauce booths next to hot dog stands. 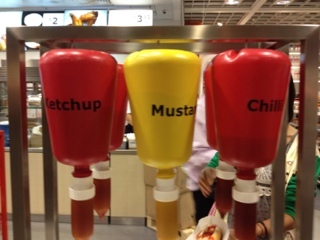 But Ikea Singapore is little bit special, it has chill sauce besides tomato sauce and mustard! I've never seen chill sauce in the ikea Melbourne! Localisation!